Built in 1894, this imposing Victorian Sandstone house was a former Church of Scotland Manse. The original manse and offices were built in 1762 at a very moderate expense. T here were various outbuildings and a large orchard. Kiltearn derives its name from two Gaelic words, Kiell Tighearn, the burying ground of the laird, and the principle family in the district, the Munroes of Fowlis, had their burying-ground at Chanonry, until 1588. The parish is situated further along the road, about a two minute walk from the former manse. The church replaced a medieval building possibly in the early 1700?s. The east gable still shows what remains of two buttresses and a drip mould which appears to have surrounded an arched window. In 1790 the church was rebuilt at a cost of £700 and it is possible then that slates replaced the thatched roof. Shaped like a 'T' with two elegant stairways leading to the floored loft, the Lairds of the three estates would sit upstairs;Foulis, Balconie and Swordale. 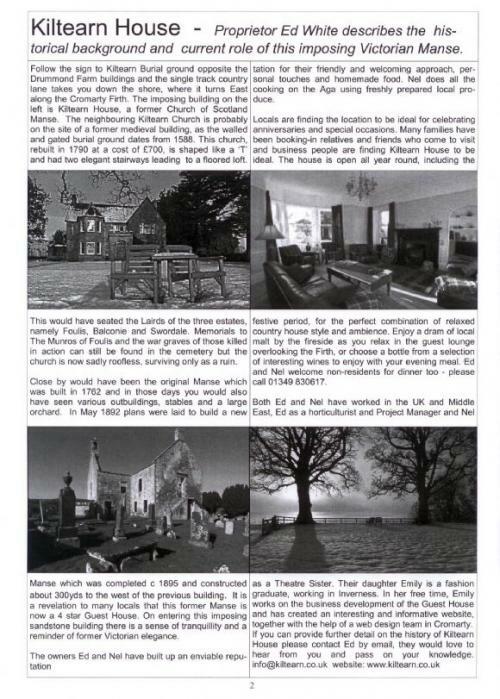 The Munro of Foulis? burial enclosure dates from 1588. At the time of the Disruption the minister was Duncan Campbell and he and most of his congregation joined the Free Church. In 1900 the minister, Murdoch MacQueen stayed out of the Union and continued as minister until his death in 1912. A parish in Ross and Cromarty until 1975, the old church is now sadly roofless and abandoned, but beautiful nonetheless. The grounds are still used for burials. View more pictures of the church here. The main theory as to the origin of the clan is that the Munros came from Ireland and settled in Scotland in the 11th century and that they fought as mercenary soldiers under the Earl of Ross who defeated Viking invaders in Rosshire. The clan under chief Donald Munro, son of O'Ceann were granted lands in Rosshire and a seat at Foulis Castle as a reward for helping King Malcolm II of Scotland to defeat Viking invaders from Scandinavia. The Munro's lands lie on the north side of the Cromarty Firth and within their lands is the mountain Ben Wyvis and the Black Rock Gorge. The castle survived up to the 18th century until it was attacked by Jacobites in 1746. The Clan Munro had been away on duty for the Government under the command of the chief's brother George Munro of Culcairn. Chief Sir Robert was commanding an English regiment at the Battle of Falkirk (1746) with his brother Dr Duncan Munro where they were both killed. After which the castle was burned by the Jacobites. Chief Sir Harry Munro set about rebuilding the castle incorporating what he could of the original building. However as the Battle of Culloden had brought a complete end to the Highland clan system there was no need for such a defensive fort anymore. As with many castles at this time it was re-built as a large mansion house as we see it today. Acquired by a Munro Chief in the early 14th century, It is still occupied by the Munros of Foulis. Read more about the history of the area here.